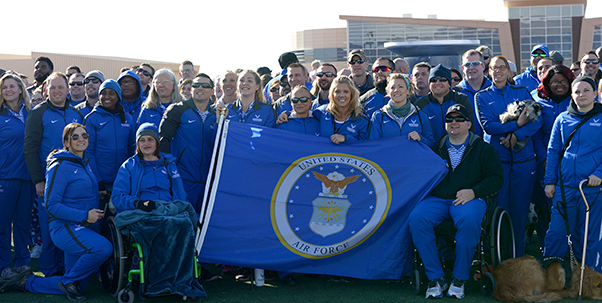 Athletes pose for a group photo during the 5th Annual Air Force Wounded Warrior Trials opening ceremony at the Warrior Fitness Center on Nellis Air Force Base, Nev., Feb. 23, 2018. Service members are participating in adaptive athletic reconditioning for lasting effects on physical and emotional recovery. 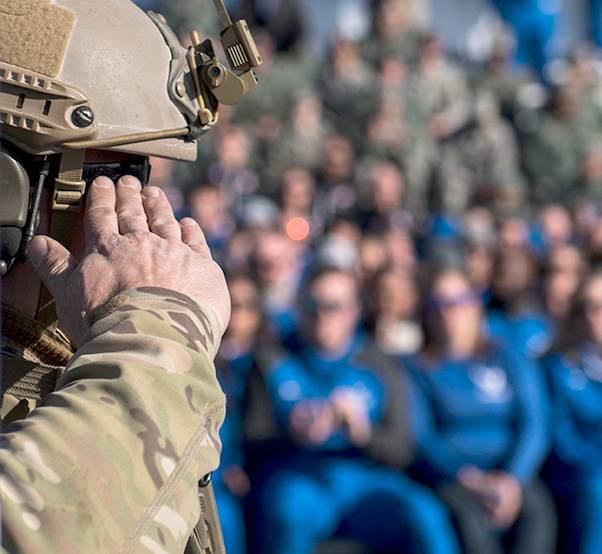 More than 150 wounded warriors from the Air Force, Army, Great Britain and Australia gathered today to officially open the fifth annual Air Force Trials at Nellis Air Force Base, Nev. 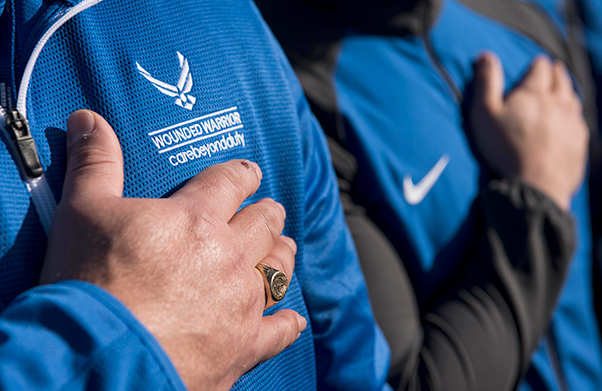 Approximately 150 athletes hold their hands over their hearts during the singing of the national anthem during the 5th Annual Air Force Wounded Warrior Trials opening ceremony at the Warrior Fitness Center on Nellis Air Force Base, Nev., Feb. 23, 2018. The trials are an adaptive sports event designed to promote the mental and physical well-being of seriously ill and injured military members and veterans. 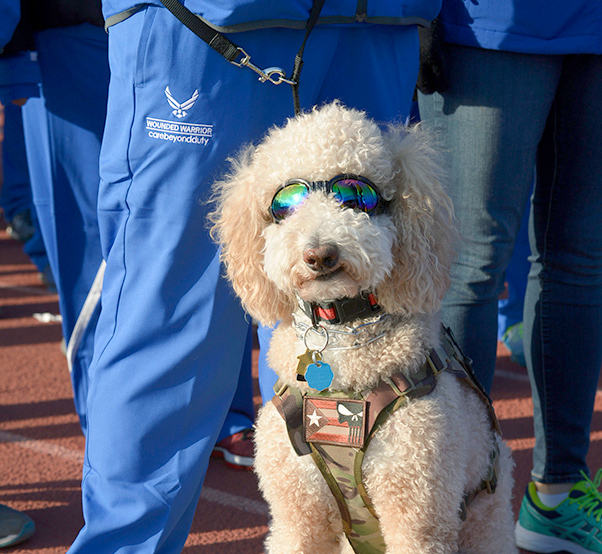 Approximately 120 Air Force athletes stand ready before the 5th Annual Air Force Wounded Warrior Trials opening ceremony at the Warrior Fitness Center on Nellis Air Force Base, Nev., Feb. 23, 2018. Staff Sgt. 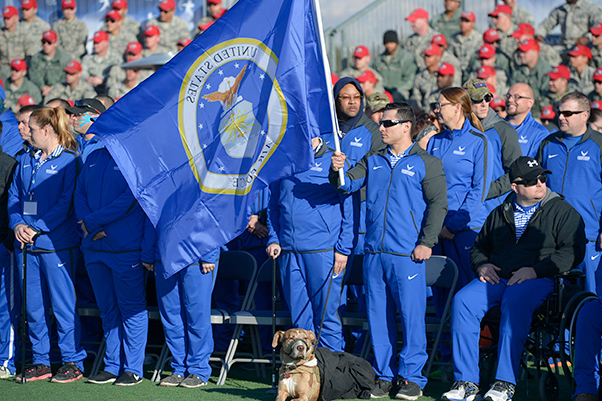 Vincent Cavazos carries the Air Force flag during the 5th Annual Air Force Wounded Warrior Trials opening ceremony at the Warrior Fitness Center on Nellis Air Force Base, Nev., Feb. 23, 2018. 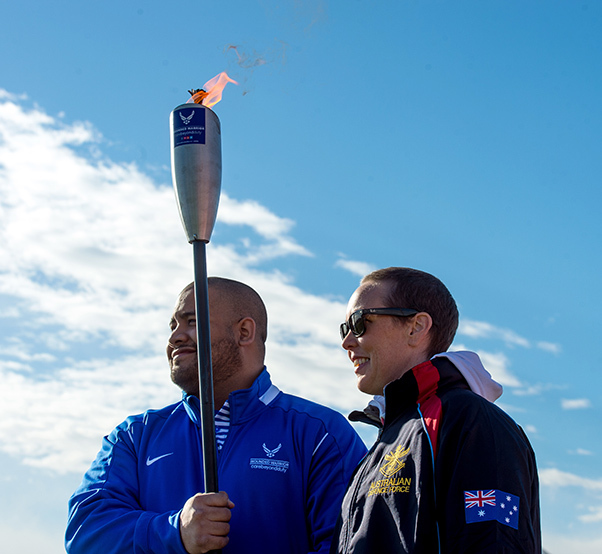 Roger Placido, Air Force Wounded Warrior team staff member, and Australian Defense Force Capt. 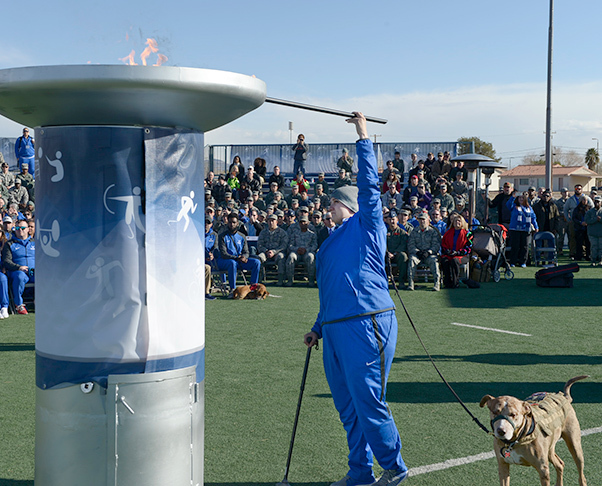 Ruth Hunt, hold the torch during the 5th Annual Air Force Wounded Warrior Trials opening ceremony at the Warrior Fitness Center on Nellis Air Force Base, Nev., Feb. 23, 2018. 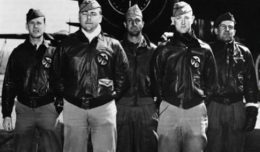 The Air Force Wounded Warrior Program is a congressionally mandated and federally funded program that provides personalized care, services and advocacy to wounded, ill or injured recovering service members. 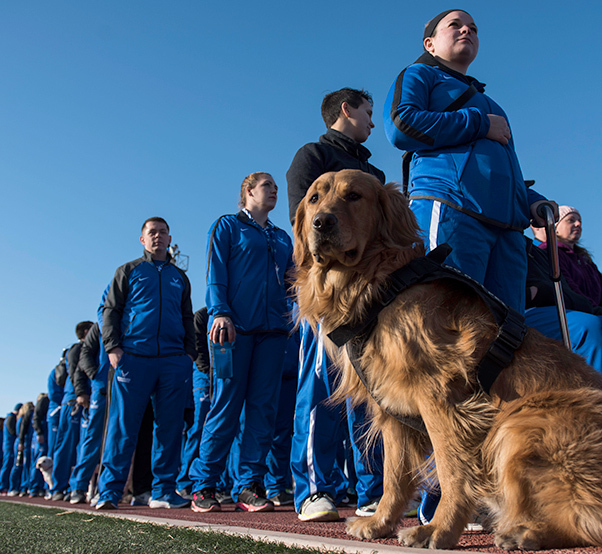 Andres Rodriguez and his service dog Sandy, stand in formation during the 5th Annual Air Force Wounded Warrior Trials opening ceremony at the Warrior Fitness Center on Nellis Air Force Base, Nev., Feb. 23, 2018. Army Spec. 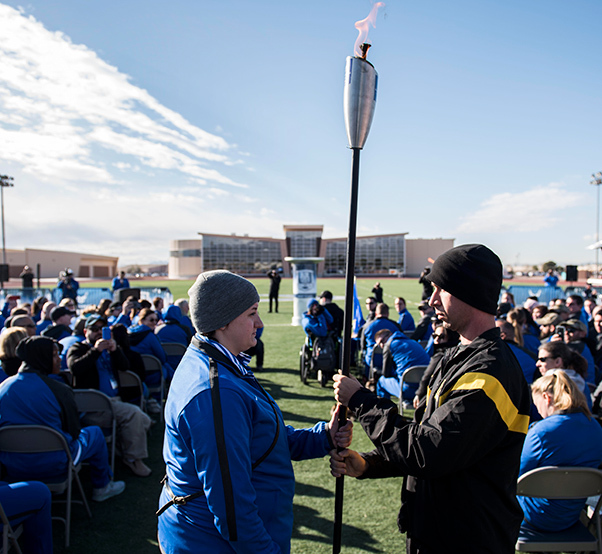 Peter Sky passes the torch to Air Force Senior Airman Hanna Stolberg during the 5th Annual Air Force Wounded Warrior Trials opening ceremony at the Warrior Fitness Center on Nellis Air Force Base, Nev., Feb. 23, 2018. Senior Airman Hanna Stolberg lights the cauldron during the 5th Annual Air Force Wounded Warrior Trials opening ceremony at the Warrior Fitness Center on Nellis Air Force Base, Nev., Feb. 23, 2018. 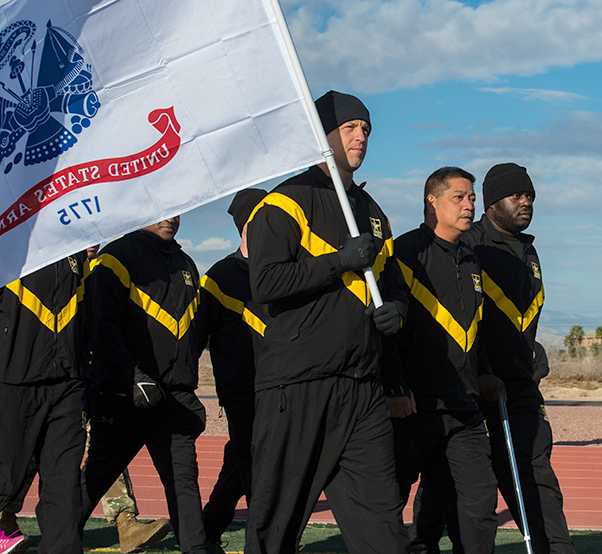 Athletes from the U.S. Army march into the 5th Annual Air Force Wounded Warrior Trials opening ceremony at the Warrior Fitness Center on Nellis Air Force Base, Nev., Feb. 23, 2018. 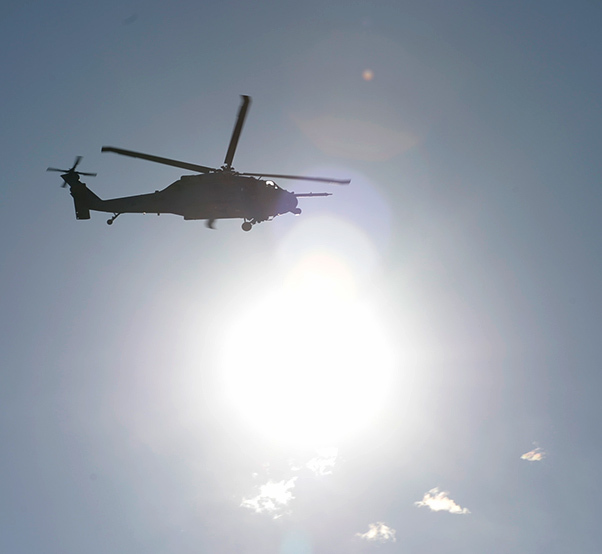 An HH-60 Pave Hawk, 66th Rescue Squadron, flies over the 5th Annual Air Force Wounded Warrior Trials opening ceremony at the Warrior Fitness Center on Nellis Air Force Base, Nev., Feb. 23, 2018. 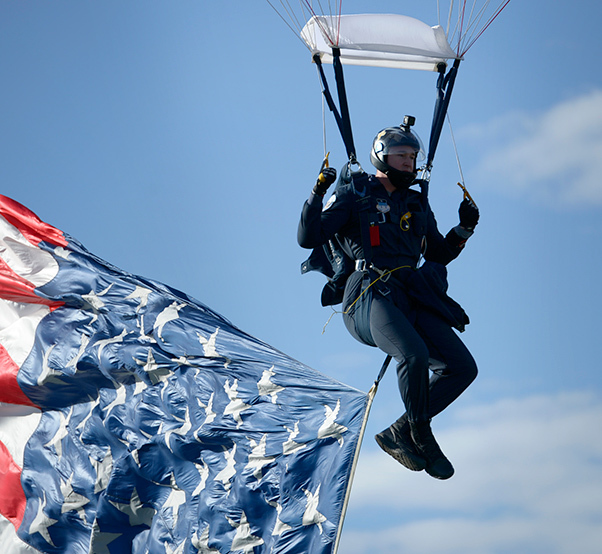 A member of the U.S. Air Force Academy Wings of Blue Parachute Team glides into the 5th Annual Air Force Wounded Warrior Trials opening ceremony at the Warrior Fitness Center on Nellis Air Force Base, Nev., Feb. 23, 2018. Capt. James Byrne, a pararescueman assigned to the 58th Rescue Squadron, salutes after handing off the wounded warrior flag during the 5th Annual Air Force Wounded Warrior Trials opening ceremony at the Warrior Fitness Center on Nellis Air Force Base, Nev., Feb. 23, 2018.